Thoracostomes (thraxes for short) are among the most successful land animals on Ilion. 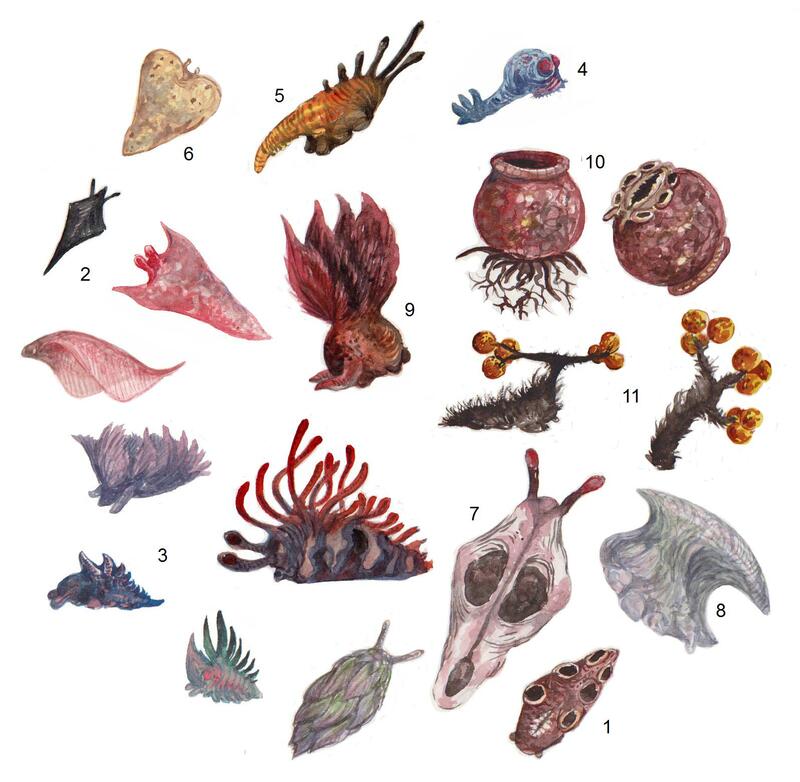 92% of detritivores and 60% of primary consumers belong to the group, owing to their versatile design and rapid rate of reproduction, among other things. They are named for the placement of their mouth, which is not in the front as in other red plant derivatives, but on the chest between the front pair of limbs. The mouth, which is filled with tiny scraping teeth, lies flat against the ground. Since this arrangement is not conducive to breathing, oxygen and carbon dioxide must diffuse across the skin. 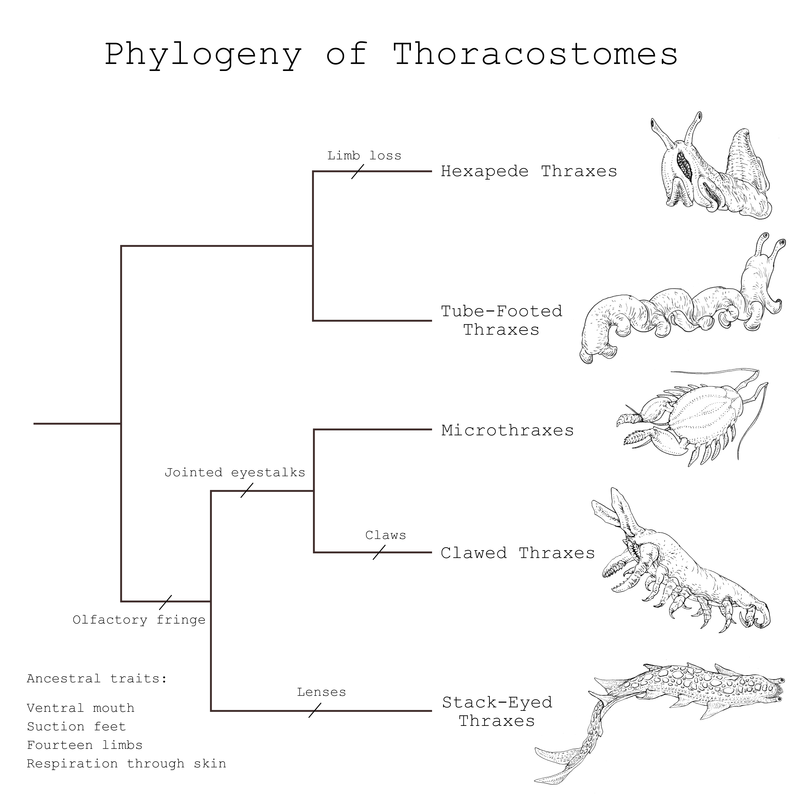 As a result, thoracostomes adapt well to an amphibious or aquatic lifestyle in freshwater and ocean habitats. Hexapede thoracostomes – A single mutation caused all of the ancestor’s offspring to develop only six out of fourteen legs. Amazingly, this deformity did not affect organ function and the lineage grew into one of the most adaptable animal groups on the planet. 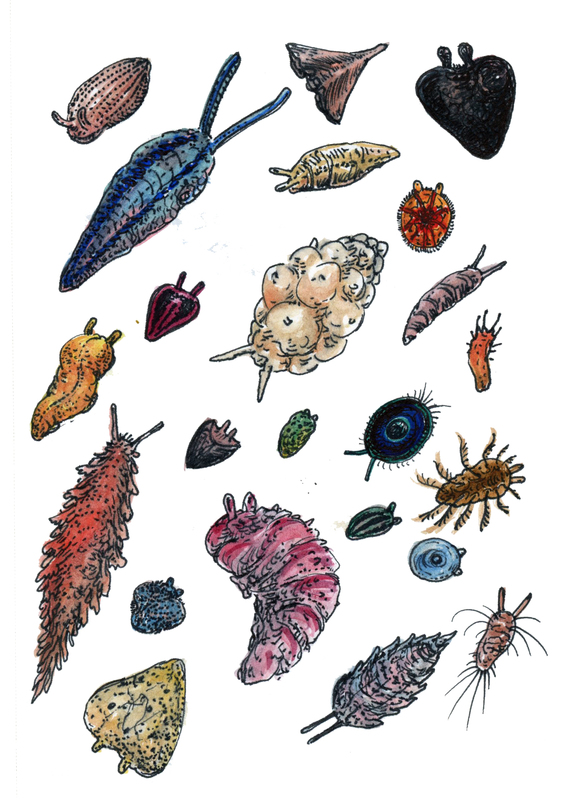 Due to their ability to concentrate toxins, microbes, and pigments in their skin, some species can be quite colorful. Tube-footed thraxes – Members of this group share many similarities to their sister clade but with longer bodies. Most tube-footed thraxes rely on concentrated toxins and warning coloration to make themselves unappetizing to predators, while others get by with camouflage. Some species have a special stomach compartment for fermenting black plant microphylls, which are normally too difficult to digest through conventional means. Microthraxes – Measuring in the millimeters, microthraxes play an important role returning nutrients to the soil. They are found in leaf litter, fur, and decaying organisms, feeding exclusively on dead material. Their eyestalks, while still functional as sensory organs, serve mainly to manipulate food. Clawed thraxes – Like the name indicates, these animals have claws on their feet for clinging to trunks and branches. Their jointed, dexterous eyestalks are perfect for seeking out higher quality food sources such as red plant fruit buds and small animals. Stack-eyed thraxes – While most thraxes have rudimentary vision, their visual acuity is poor. Stack-eyed thraxes evolved to secrete a substance into their heat pits that hardens into a lens. The lens only lasts a limited amount of time before it becomes too cloudy to see through and must be shed on a regular basis. The photoreceptors fall out with it and a new eye and lens erupts from below, much like shark’s teeth. 1. 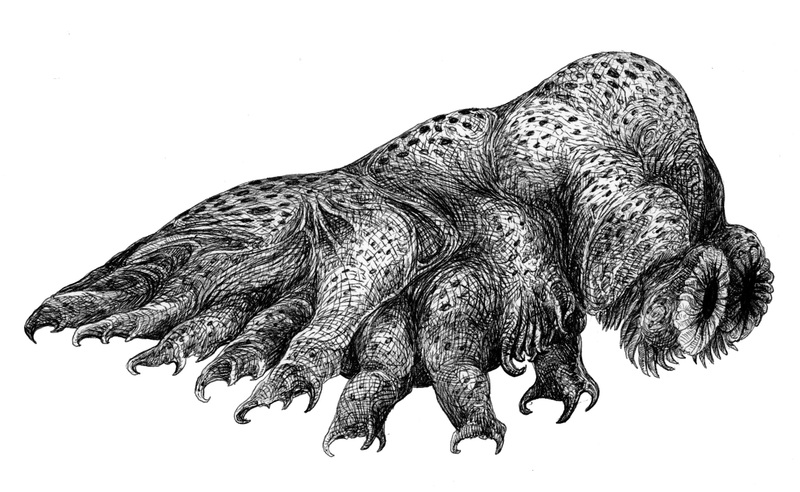 Ventral view of a typical hex thrax. Six suction pad feet and a radula lie flat against the chest. 2. Obsidian thrax and two unnamed species adapted to freshwater environments. 3. Five brachyderm thraxes. Branched and feathery extensions of the skin aid in thermoregulation, gas exchange, and camouflage. 10. Planted pot (a red plant) and its mimic, the faux pot. 11. The berries of the black plant on the right are a dietary staple of many herbivores. The prominent structures on the imitator’s stalk are filled with eggs. The male cements the egg sacs onto the female’s stalks and fertilizes them before wandering off in search of another mate. When eaten, the larvae hatch and parasitize the host until they reach breeding age. 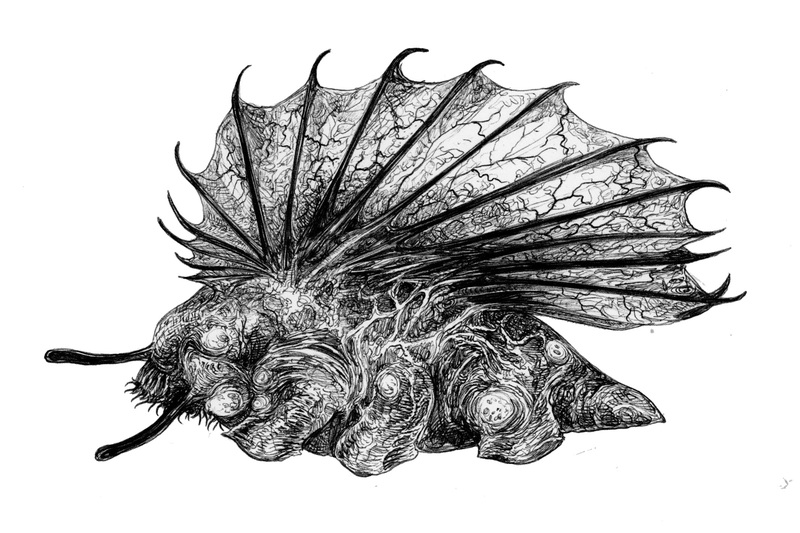 The fan thrax is a typical hexapede thoracostome, displaying the usual six suction-cup feet, two infrared-sensitive eyestalks, and a ventral mouth. The sail aids in thermoregulation and gas exchange. The boils are filled with a foul-smelling pus to discourage predation. 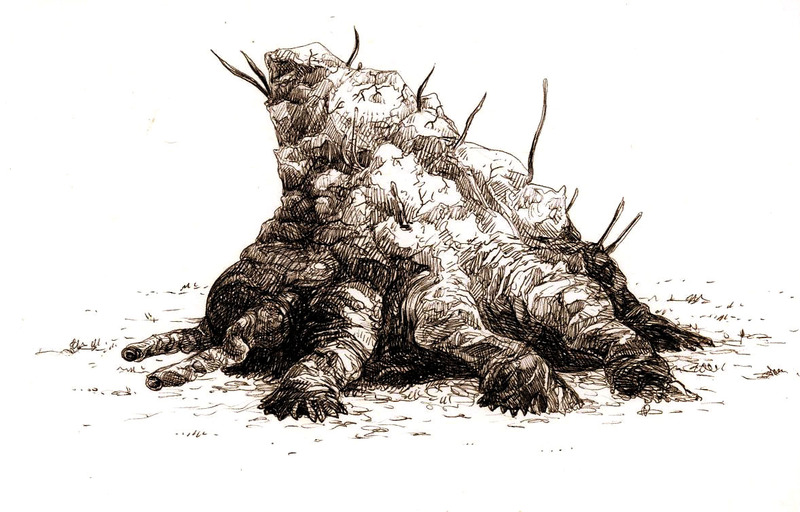 The rock thrax lacks chemical defenses and depends instead on camouflage to avoid detection. The animal and its relatives scrape lichen-like plants off rock faces in mountainous regions. They will sometimes allow commensals to grow on their backs to complete the illusion that they are just another part of the landscape. Even if detected, they are almost as tough as they look and are very difficult to pry off. Seaglass thraxes and their relatives are a common feature on the continent of Pandaros and Deiphobus. They spend their lives foraging for grubs, thraxes, and mobile fruits. A symbiosis with blue mold gives them their blue-green coloration and makes them mildly poisonous to most predators. The hognose thrax is a semi-arboreal plant eater not unlike squirrels: it can scamper up and down trees with its fourteen clawed feet and cache food to be located later with the help of an olfactory fringe lining the base of its double snout. Dextrous mouthparts enable it to capture and manipulate all sorts of food items. The tree-hair louse taps into the microphylls of black plants to access sugars and nutrients that pass through the plant’s bloodstream. The blue slimer is a rare predator in a clade dominated by plant eaters and detritivores. A sticky mucus secreted from the heat pits traps small prey items, which the animal either devours immediately or stores for later consumption. Zipper mouths. 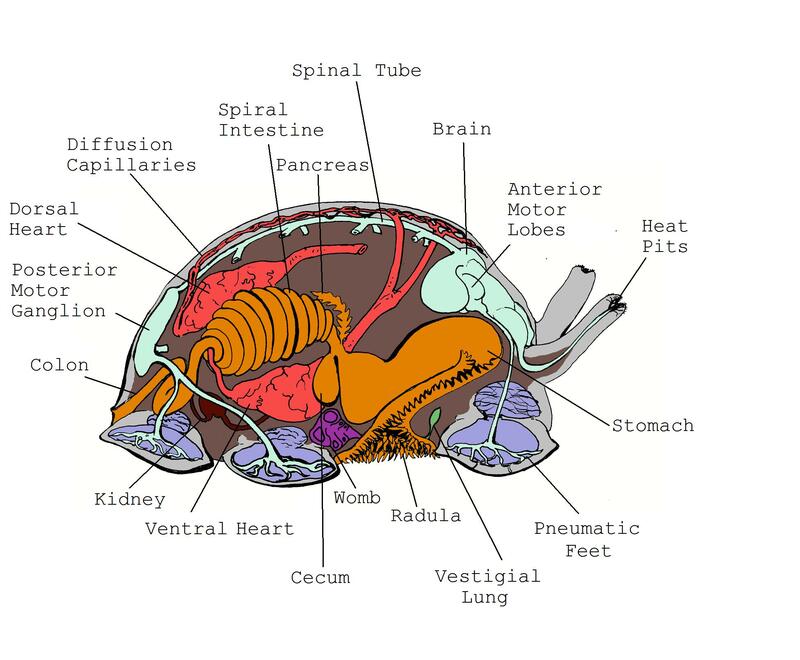 The entire length of their digestive tract opens to the outside. Even though it is derived from a one-way gut, it functions more as a blind gut for filtering sediment at the bottom of the ocean. Whipple, named for its mating call. The tympanum is brightly colored in near-infrared. Common trailblazer, named for the scars it leaves on plants as it feeds. Mossy cetus, an ocean dweller that can reach lengths of five meters or more. The hair is a sophisticated gill system that doubles as camouflage in the weedy shallows of Aeneas’ west coast. The juggler feeds exclusively on the haploid fruits of the black pearl bush. The bush supplies the juggler population with an unpredictable supply of seeds, forcing the animals to cache seeds for later consumption. Seeds that aren’t eaten soon enough will mate and germinate into the next generation of black pearl bushes. “Almost two centuries ago, an explorer fell into a hidden lake on the continent of Pandaros and encountered an entity she could not see, only feel as it passed. She described it as “long,” “sharklike,” and “silent.” The crew was not outfitted for a proper dive so the nature of the beast would have to remain a mystery – until now. The bottom of Hidden Lake is dark – so dark that plants would struggle to gather enough sunlight to grow and sustain themselves. So why are there plants on the lakebed? Because it is not always this way. Periodically the surface mat loses its integrity to heavy grazing or severe weather, leaving islands of crimson buoyphyte (Stagnicorium puniceum) to float among loose vegetation, mostly germinating calaveras and Carellos’s buoyphyte (Zygophyta laxa). The light gives the plants the energy boost necessary for reproduction. At other times, the plants live as heterotrophs, trapping detritus and plankton in their gill-like leaves. 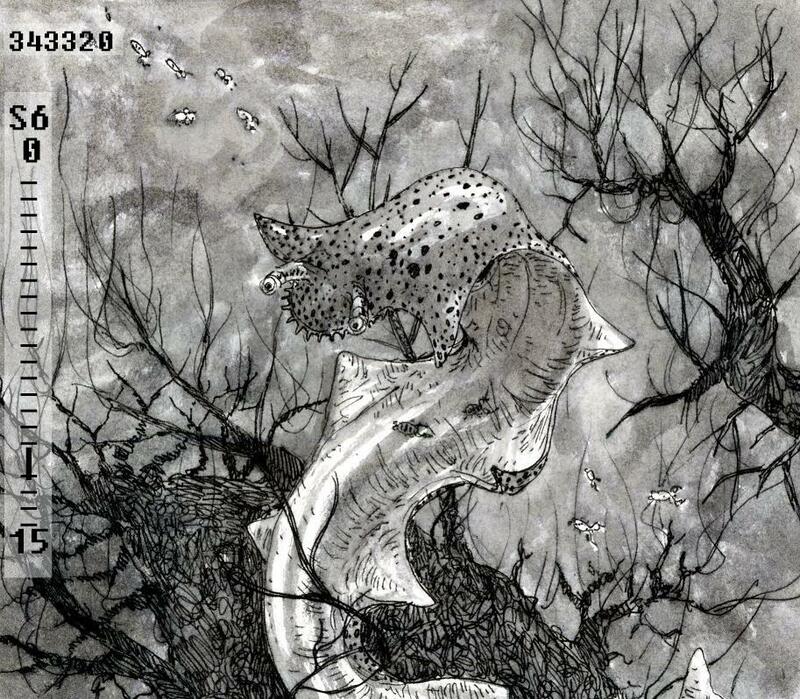 The ghostly figures swimming above the vegetation are Hidden Lake cetuses. These gentle serpents feed on the fruits of lakebed calaveras and anything else slow enough to capture. They use the cloak of darkness and silence to evade predators, as they cannot defend themselves in a fight. They are intelligent and naturally curious. If a stranger is not a known predator, they will gather in small groups to investigate, either in search of food or simply a novel experience. Decades after their first encounter with a human explorer, Hidden Lake cetuses were studied in depth by a Helen of Troy probe.